Leaders plead with community to stop violence and come forward with information to solve four homicides – Welcome to Wyandotte Daily! Community leaders and police today made an impassioned plea to community members to come forward with information to solve four homicides within the past week. Just an hour or so before a news conference at Kansas City, Kan., police headquarters this afternoon, the fourth homicide of the week was reported near 21st and Quindaro, according to police. A man in his 30s was found dead from apparent gunshot wounds, police stated. •	A homicide was reported Friday night, Sept. 2, a drive-by shooting that killed a teenage girl in the 500 block of Freeman at 6:33 p.m.
•	A homicide was reported Aug. 31 in the 100 block of South 12th St., a drive-by shooting. •	A homicide was reported Aug. 30 in the 2400 block of North 9th St., a drive-by shooting at 3:47 p.m., and the victim died inside her home. Deputy Police Chief Tyrone Garner said there was an unprecedented level of crime and violence currently in the community. “What you see behind me is a unified front of elected officials, community leaders and concerned citizens that are here today to stand with the police department, and say enough. 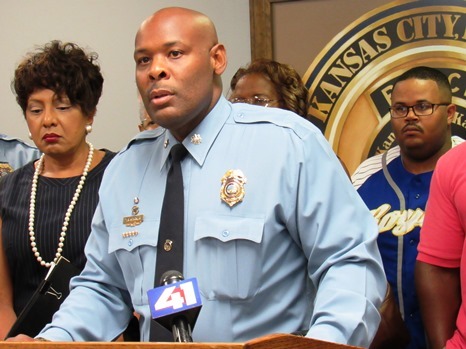 Enough is enough of the violence and crime that is going on in our city of Kansas City, Kan.,” Garner said. Garner said the homicides affect the community not just for a week, but they affect the families of the victims for a lifetime. Grieving families and friends of the victims plan a candlelight vigil at 6 p.m. tonight near 9th and Cleveland. Since July 5, there have been 14 homicides in Kansas City, Kan., Garner said. He said so far this year, there were 28 homicides in Kansas City, Kan., as compared to 22 at the same time last year. Garner said there have been some community calls to the TIPS hotline, 816-474-TIPS, but that more information is needed. “We’re going to aggressively and actively seek to get these individuals … off our streets,” he said. He said the police department will be knocking on doors, seeking information about the crimes, and intensifying its efforts to solve them. A task force is working on it currently. His message to anyone considering violence was to think twice, because the violence has to be stopped, he said. There is no reason, no excuse for anyone in the community to take the life of anyone at any time, he said. “Tuesday night, a young mother, about 30 or so, was gunned down while sleeping in her bed, sprayed down by a barrage of bullets while sleeping in her bed, in a place where all of us should feel safe,” UG Commissioner Gayle Townsend said. She said members of the community have to speak up and be supportive to stop this activity. While community leaders were preparing to get their message out about stopping violence, another homicide occurred last night, and then another one this afternoon. “Even though the bullets have plunged the particular families involved into abject grief, they continue to take other victims,” Commissioner Townsend said. She said all members of the community have to take responsibility, and she was begging anyone with information has to come forward. Besides grieving families, the killings are hurting the community as it tries to develop the northeast area, she added. While the UG has put money into the budget to help develop the area, the perception that the community is not safe could stop prospective businesses from locating here, she added. Commissioner Townsend said she would support any lawful means the Kansas City, Kan., police use to bring the offenders to justice. Commissioner Harold Johnson said he was pleading with the community to rally behind the families that are grieving, and he is imploring the community to speak up and say something. “We are just one or two persons away from knowing who are these persons that have committed these acts of violence and murder in our community. 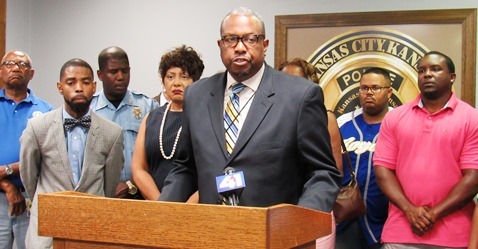 As a father, right now I am completely perplexed and appalled and hurt by these murders that have taken place in our northeast section of Wyandotte County,” Commissioner Johnson said. He called on those who have committed acts of violence to turn themselves in. Garner asked persons with information to call the TIPS hotline at 816-474-TIPS or the police department at 913-573-6030 to report acts of violence. Rewards are offered for information leading to the solving of the crimes. Neighboring Kansas City, Mo., has experienced a large number of homicides this year, with 74 homicides reported so far, according to recent reports. Some Unified Government officials could not attend the news conference because of the holiday weekend. Mayor Mark Holland sent out a statement: “In the last week, four people have lost their lives in drive-by shootings. It is important for us to remember that these four victims leave behind families and friends. My thoughts and prayers are with all of those who are grieving.